Goodwrench was promoted to customers as the assurance that trained technicians would service and repair any GM vehicle brought to a GM dealership using GM factory-made replacement parts. DETROIT -- General Motors Co. is dropping the GM Goodwrench car mechanic brand in the United States as the company moves to redirect the marketing emphasis around its four core vehicle brands, the company announced. The long-standing Goodwrench brand -- used by GM dealers to promote vehicle repair and maintenance services -- will be replaced by Chevrolet Certified Service, Cadillac Certified Service, Buick Certified Service and GMC Certified Service, GM said in a statement released Monday evening. GM marketing chief Joel Ewanick wants the vehicle brands, not corporate, to be the stars of GM, and that includes service and repairs, said one source familiar with the new campaign. “This is another part of the effort to clear out brand clutter,” the source said. The phase-out is effective Feb. 1 in the United States, the statement said. The brand will remain in Canada where it still holds some cachet, the source said. “Certified Service supports GM's strategy to focus on the four brands – Chevrolet, Buick, GMC and Cadillac -- and is a natural extension of the customer's vehicle purchase experience at the dealership,” Steve Hill, vice president and general manager, GM Customer Care and Aftersales, said in the statement. The brand, launched as Mr. Goodwrench in 1974, was once a household name when GM was a much bigger automaker. The name, which GM changed from Mr. Goodwrench to Goodwrench Service Plus in the '90s, also was a major sponsor of NASCAR racing -- including Dale Earnhardt Sr.'s car -- for several years until it dropped its involvement in 2007. 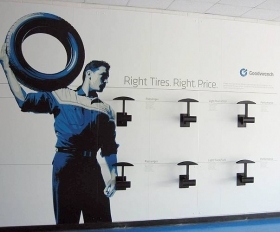 But in recent years, many of GM's 4,500 dealers failed to use the Goodwrench signs at their stores or put the logo in advertising, the source said. Leo Burnett, of Chicago, is the agency of record for the Goodwrench brand and also GMC and Buick. DETROIT, MI – As part of the initiative to better connect General Motors' brands with customers, Chevrolet, Buick, GMC and Cadillac will each receive its own Certified Service brand. Chevrolet Certified Service, Buick Certified Service, GMC Certified Service and Cadillac Certified Service are being launched as part of a larger strategy by the company to strengthen the relationship between the customer and the four brands. “Our number one priority is providing a world-class ownership experience that creates positive long-lasting relationships with our customers,” said Steve Hill, vice president and general manager, GM Customer Care and Aftersales. “Certified Service supports GM's strategy to focus on the four brands – Chevrolet, Buick, GMC and Cadillac -- and is a natural extension of the customer's vehicle purchase experience at the dealership. "This is more than a name change -- it is a declaration of our commitment to our customers, with exclusive vehicle diagnostics and connectivity via OnStar, competitively priced services and parts, increased advisor and technician training, and working jointly with our dealers to focus on customer satisfaction." Customers will continue to receive competitively priced service performed by trained experts who know their vehicles best at dealerships across the country. Service is an integral part of vehicle ownership, and customers who are satisfied with their service experience are much more likely to return to the dealership. As an extension of this strategy, GM will phase out the Goodwrench brand name effective Feb. 1, 2011 in the United States.